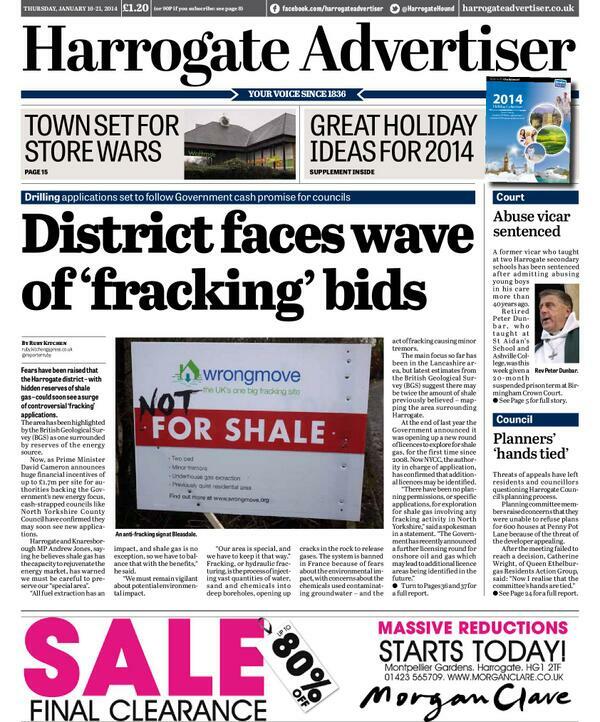 The Harrogate Advertiser went tabloid in 2012 but has now carried out a further redesign following reader feedback. Wrote Jean: “We’ve been listening to our readers ever since the Harrogate Advertiser series of newspapers changed to a tabloid format. “From those discussions, we’ve made some more changes to the newspaper in line with your feedback. “From our focus groups with readers, and non readers, we were told very firmly that people wanted articles ‘to get their teeth into’. Jean said that a key element in the reader feedback was the issue of navigation. “When we first changed the ‘Advertiser to a compact shape, readers said it was difficult to find their way around the newspaper. “So we have been improving the indexing since then, and now there’s a very clear contents panel on page 2, and indexing for the different sections throughout the newspaper. The Advertiser is published by the Ackrill Media Group, which is part of Johnston Press. If this marks a departure from JP’s standardisation, one size fits all, every newspaper must look the same, no place for local creativity, this way or no way, central thought leadership philosophy then this is a very good thing. The idea that every newspaper can be produced to a rigid formula irrespective of its local market, its heritage or its content will prove to be one of the most misguided of all JP’s self-destructive decisions. As evidenced by the sharp decline in circulation performance since the much lauded “re-launch” programme (whether the title needed it or not). I wish these big corporate “strategies” got better, more rigorous scrutiny. 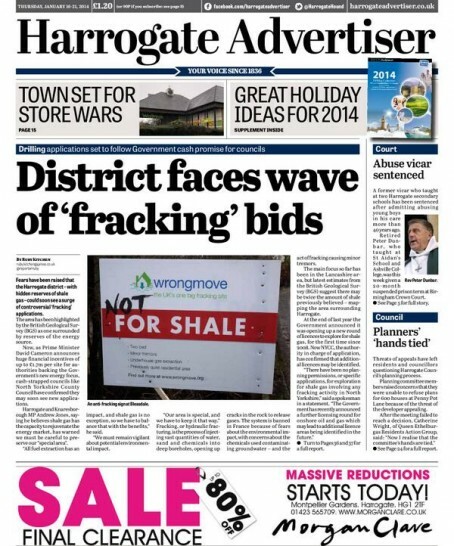 At least the Harrogate Advertiser (which was a very good broadsheet newspaper before it was standardised) is being given a chance of regaining an identity – relevant to the market it serves, rather than relevant to the whims of head office. Close your eyes. Open them again and what do you instantly see. Everything! So it’s not working … at least do away with black typeface in the puff panel and readers might have a chance of picking out either the splash head or your old fangled masthead! Hmm…not sure about the splash typeface – looks far too heavy (is it CSB?) and seems at odds with the modern, clean lines of the design. The kerning is a bit tight too. I like the masthead typeface – this is in keeping with the overall look of the page. I assume “district” is a local vernacular that chimes with the readers, otherwise it’s a clunky headline word taking too many character spaces. I’d have gone for “Driller chiller” myself! As an ex-Editor of 21 years standing, I always thought it was advisable to listen to existing readers – after all they help pay the wages. Asking people why they don’t currently buy the product is equally – if not more -important. Jean is a great person and very experienced Editor and I wish her well. She is one of the few people I know who could get JP to deviate from its strict (and, frankly awful) design constraints. Not sure this can be classed as bowing to ‘a few busy body whingers’. The sales figures have been plummeting since the Advertiser was redesigned and went tabloid (from less than 5% down year on year as a broadsheet to upwards of 10%, from what I’ve heard). However, I’m not sure a new masthead and some more in-depth features will fix the problem – more to do with reflecting the community’s concerns, and doing so with a sense of authority and professionalism, which seems to have been lacking in the last few years. The Harrogate Advertiser recorded a 16 per cent circulation drop last February, which largely reflected reaction to the JP-imposed tabloid redesign. I doubt if the figures have improved since. Well done to Jean for managing to get this semi u-turn. Also, well done to her depleted staff for having to cope with such tough times. However, JP is doing good job of destroying a publication – through job cuts, centralised production and loss of local identity – which should have been an cast-iron revenue earner for them.